Riding the subways of New York is always a unique experience. It runs the gamut of wonderful, inspiring, depressing, disgusting, repulsive, and dangerous. It can also be quite cathartic. Part of the experience is viewing the diverse set of both intentionally and unintentionally absurd posters plastered across nearly every station and inside nearly every train - primarily serving as advertisements. Today I realized that I've grown immune to actually noticing most of the posters. The promise of perfection is no longer an effective attention-getter. I do notice those posters which are in some way flawed, imperfect, or clearly vandalized. If something is out of place, unexpected, or obscene, I will usually take an extra second to see which unfortunate brand has been affected. This is probably neither positive nor negative for the advertisers. But it does indicate that the dirty and deranged is still unexpected and eye-catching in certain environments. Flaws will probably force people to take notice, but the impressions may be counter-productive for the brand. Some companies may benefit from intentional flaws if all they seek is attention. 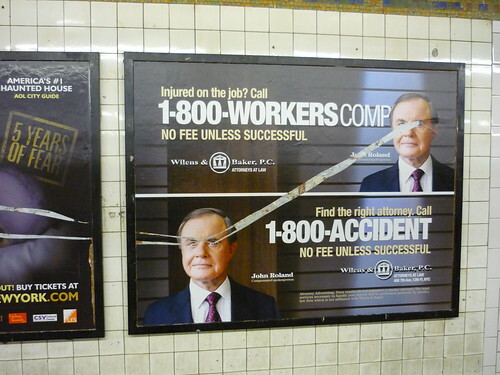 Subway poster Vandalism Art, originally uploaded by Mark_Baratelli.